DURHAM: Virginia R. Roberts, 97, of Durham passed away Saturday, November 10, 2018. Mrs. Roberts was born on October 1, 1921 in Vance County, NC, the daughter of the late Royal Wesley Robertson and Sue Martin Robertson. She was preceded in death by her husband, Harold Garland Roberts; brothers, Harold Wesley Robertson, John W. Robertson, Sr., Tucker Martin Robertson; and step-son, Harold Thomas Roberts. 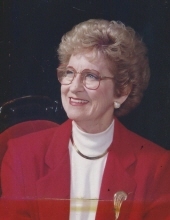 Mrs. Roberts is survived by her daughter, Robyn Roberts Frid (David); son, William Alan Roberts (Mary Tom); step-daughter, Jean Bass (John); daughter-in-law, Jackie Roberts; five grandchildren, Allison Roberts, Jamie Hammons, Lauren Smith, Adam Roberts, and Zachary Frid; and five great-grandchildren. A Memorial Service will be held Saturday, December 8 at 1pm at Aldersgate United Methodist Church, 1320 Umstead Rd. Durham, NC. The family will receive friends following the service in the AUMC Wesley Room. Burial of cremains will follow at the Rose of Sharon Baptist Church Cemetery. To send flowers or a remembrance gift to the family of Virginia Earl Roberts, please visit our Tribute Store. "Email Address" would like to share the life celebration of Virginia Earl Roberts. Click on the "link" to go to share a favorite memory or leave a condolence message for the family.